by Howard P. Johnson Jr.
As a kid I helped my Dad refinish and maintain his boats, by the time I was a teenager he was letting me handle the bottom and the varnish but never use the boat. 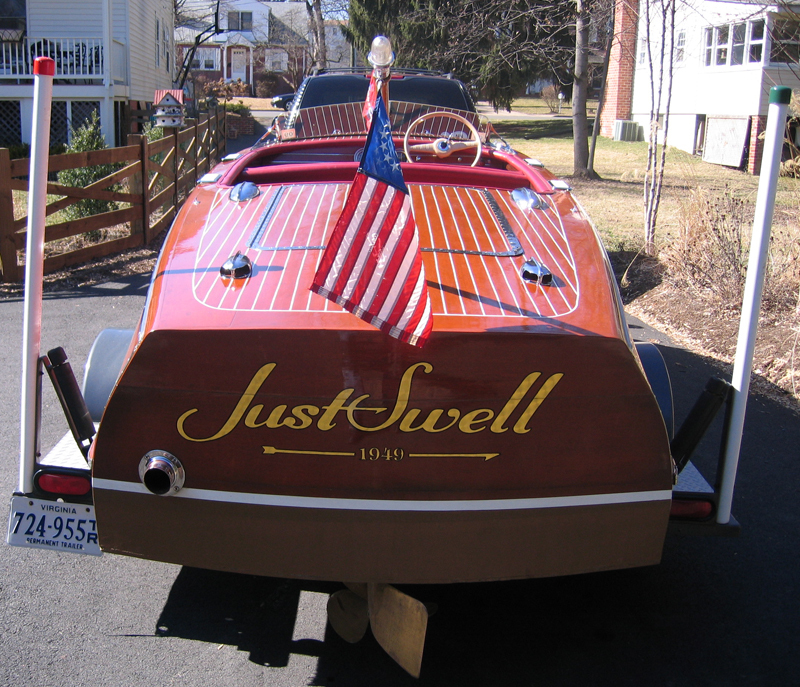 I finished my first more recent Chris Craft restoration in `94 and couldn’t come up with a good name. The transom was huge and finally I settled on GIFT FROM OUR PAST. Later I admired PASTIMES, on another person’s transom. Naming a boat well is an acquired skill. With practice I have gotten better at picking them. When I see a newly restored boat with no name on the transom, I know why it’s not there. It can be tough coming up with one you like. The fabulous ACBS Directory has an excellent alphabetized boat name listing. This amazing variety ranges as far and wide as the imagination of very creative people. These names tell the story of marriages and love affairs with people and boats, sentimental, historical, and financial. Admiration, desperation, perspiration, dismay and double entendre, all are characterized. There are trick names, famous names, dirty names and familiar names; people use song names, movie names, women’s names, drink names, foreign names, ship names and the stars and constellations. How about 4-CRUZIN or AHH-AHH, ALL SCREWED UP or BARREL ‘N BY. BLOOD SWEAT + YEARS, is catchy, BOATJOLAIS, is tricky, CHAOS, says much about the project; CHUGALUG 2 is refreshing. CLASSIC BLUNDER, tells a story while DEJA VROOM goes flashing by; EGGSTROIDINAIRE is gastronomical while EL STINKO might happen later. FIN-TASTIC describes styling, FOR SALE becomes a permanent condition, while HADA-HAVIT could have resolved the previous one. JET LAG seems strange on a boat while KNOT SO FAST seems appropriate, LUNA SEA is similar to LUNA-TIKI while MAY FLOTE seems hopeful. MY ERROR sounds like some I own, NIGHTMARE may be a bit extreme, SEA-DUCER is creative, SKI ANTIQUE combines some favorites while VARNISHING BREED describes us all. WOOD ‘N WORK is apt but if you can’t think of anything why not go with WHAT’S HER NAME. Names beginning with THE were most numerous while names beginning with MISS came in second, you’ll see your friends boats in there and some famous ones you remember and who knows, find the name for that next boat you’ve been thinking about! What In The Heck Was Classic Boating Magazine Thinking? Thanks Howard for sharing that story with us, it was great! If you plan on having more than one boat, name the all after you wife. She has more than one name. I always liked the name "Honey's Money"! Timely post ! I was fascinated by the insight – Does anyone know where my business might be able to get ahold of a template CA FL-395 document to complete ?